The message you will see shared is…. 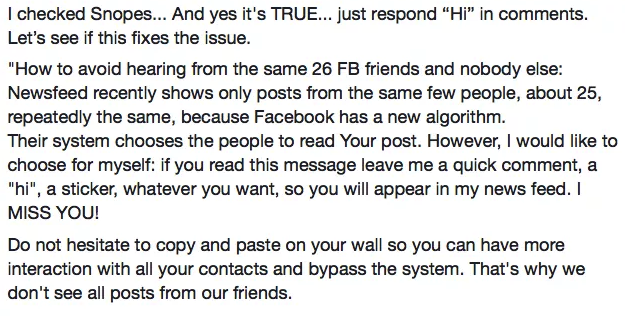 Their system chooses the people who will read your post. No, in fact Facebook can do may things, but choosing who will read your post and then just not show others is not what it does. If you are on selected to Top Stories then FB will sort your list based on popularity on the subjects of posts. IE – The post about the latest gossip (Hollywood / Politics) may show up on your list before the post showing what someone had for breakfast. However if you move to Most Recent , FB just shows you the postings in order. If you are reading this message leave me a quick comment, a “hello”, a sticker, what you want…..
Notice it doesn’t say Tag Me. Unless you tag someone when leaving them a message, the message is considered a basic message, not directed at anyone. If you want to get someone’s attention you need to tag them. Thank you for the heads up from those who already copied and pasted the above. Hold your finger down anywhere in this post and “copy” will pop up. Click “copy”, then go to your page, start a new post on your page, then put your finger anywhere in the blank field. “Paste” will pop up and click paste and voila, you’ve just copied. This one should ALWAYS be the giant warning flashing in front of you. If you ever see a message that says you need to copy and past the message instead of sharing it, you should instantly say to yourself NOOOOOOOOOOO!!!!! There is also the variation to the post that claims. Note there is NO link in the “I checked Snopes”. That’s because if you look at Snopes, they tell you this is fake. 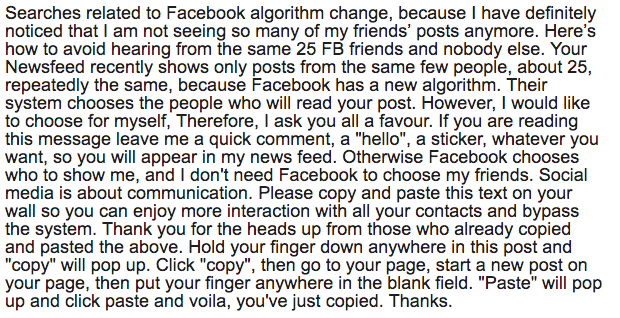 So DON’T be that person, and check out how valid things really are on posts that ask you to copy and paste. Know before you share.